I-Y16419 is found today in Italy, the Balkans, Eastern Europe, Turkey and the Caucasus, as well as a few outliers in England, Germany and Mexico. All these men descend from one man who lived 1300 BC. The 13,000 years preceding this man was a bottleneck, a single lineage from father to son to son (etc) with no other surviving siblings. Most I2 subclades are European, but it is not so straightforward to explain the origin and subsequent migrations of Y16419. His sibling S6635 is found all over Europe and new sibling BY160929 found on FTDNA has just two samples, an Egyptian descending from Dawud Agha and a Reunion Islander. Given the large geographic distribution of these siblings and the immense timescale involved, analysis of Y16419 subclade distribution is necessary to get a better idea of where the founder lived. Was the man at the end of the bottleneck in 1300 BC living in Southeast Europe, Eastern Europe, Anatolia, the Caucasus, or elsewhere? The The I-L596 FTDNA Project page contains many more samples than are shown on the YFull at this time. Origin of Y16419 computed as NW Caucasus. Note this is based only on YFull data which is very scant. I will recompute later on full set of data. Two theories I will consider here are that the ancestor was a Proto-Armenian living in eastern Anatolia/Armenia or that the ancestor was living in the Balkans and a member of a Paleo-Balkan / Proto-Armenian tribe whose progeny over the next centuries participated in the ethnogenesis of the Greeks, Albanians and Armenians. If the ancestor in 1300 BC was living in eastern Anatolia or Armenia then the most troublesome regional distributions are in Italy and the Balkans along with the German, English and Mexican outliers. It is also far afield from the rest of I2 in Europe. It would mean that the two Pontic Greek subclades were originally Armenian (or Proto-Armenian) Anatolians who adopted the Pontic Greek cultural identity after Greek colonization of the coasts. This could have happened via two Armenian men marrying into Pontic Greek families. In both Pontic Greek subclades A1143 and Y16418>BY4177 the Anatolian Armenian and Pontic Greek geographic distributions nearly overlap. It is worth noting that A1143 project contains three Greeks of non-specific origin while both Greek subclades contain Pontic Greeks. An Armenian presence in Italy, Thrace and Macedonia could be due to Armenian religious refugees known as Paulicians, or a number of other waves of exodus. There are a number of Indo-European speaking groups, starting with the Hittites, for which we have good archaeological and historic evidence that they migrated from the Balkans to Anatolia. If Y16419 originally lived in the Balkans then the bulk of the successful lineages were formed by members who migrated in a similar fashion to eastern Anatolia and Armenia. In this case, the descendants currently living in Europe are the remnants of those that stayed behind rather than needing to be explained by more recent Armenian or Armenian turned Pontic Greek-diaspora. It is generally assumed that the Hittites and Luwians came into Anatolia some time before 2000 BC. However the Y16419 diversification happened later (current estimate at time of writing 1300 BC), around the time of the late Bronze Age Collapse of 1200 BC. 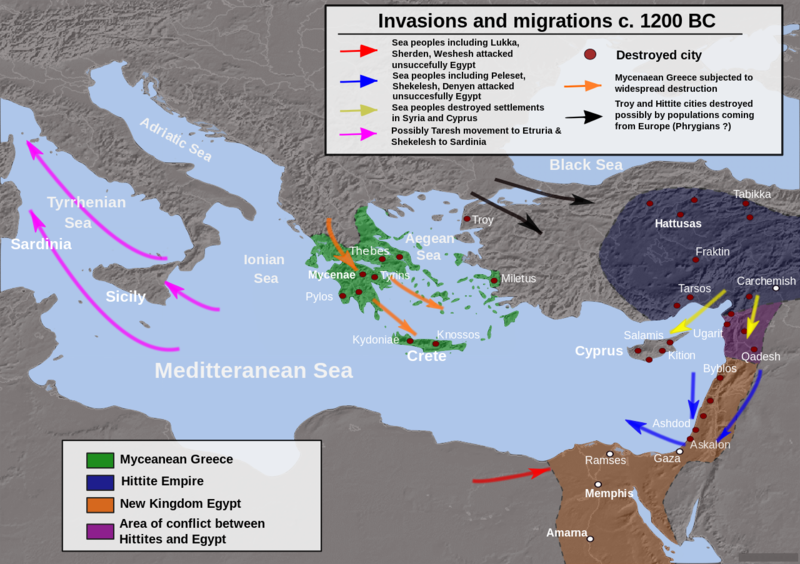 During what has been described as a systemic collapse of trade networks, many civilizations around the Mediterranean went into decline. Many centers of population and palatial sites were destroyed or abandoned. An informative book about this is 1177 BC: The Year Civilization Collapsed by Eric H Cline. After the collapse of the Hittite Empire the political vacuum in central-western Anatolia was filled by the Phrygians. A supposed Armenian migration from the Balkans is not well supported like the Phyrgians. But it appears that after the fall of Urartu around 600 BC, an Indo-European language with no prior written antecedents became spoken among a population of Hurro-Urartian langauges in the mountainous region of Eastern Anatolia (Clackson, James P. T. 2008. Classical Armenian. In: The languages of Asia Minor (ed. R. D. Woodard). P.125.). Perhaps the Indo-European nucleus of this group had accompanied the Phrygians from the Balkans and with them overthrew the Hittites. The Graeco-Armenian theory posits that Greek and Armenian derived from a common ancestor language known as Graeco-Armenian. This theory is not generally accepted but the lack of a confirmed linguistic link does not preclude the possibility of some kind of Paleo-Balkan Indo-European speaking tribe having participated, to varying degrees, at least genetically in the ethnogenesis of Albanians, Greeks, Armenians or peoples who spoke now extinct Indo-European languages of the Anatolian or Paleo-Balkan branches. Are there similar genetic links between Armenian and Balkan subclades in other haplogroups with TMRCA 1300 BC? The next state to emerge in this region after the fall of the Hittites in the 12th century BC is Urartu. During the 11th and 10th centuries BC, the kingdom eventually encompassed a region stretching from the Caucasus Mountains in the north, to the borders of northern Assyria and northern ancient Iran in the south, and controlled much of eastern Anatolia. Though it's leaders spoke Urartian, it is unknown what language was spoken by all the peoples of Urartu at the time of the existence of the kingdom. However, there is linguistic evidence of contact between the proto-Armenian language and the Urartian language at an early date (sometime between the 3rd—2nd millennium BC), occurring prior to the formation of Urartu as a kingdom. If any of the Georgian subclades of Y16419 end up having TMRCAs near 1300 BC it could mean that they entered Kartli in the centuries following the decline of the Trialeti Culture, possibly from Urartu. Where do the English, German and Mexican outliers fall in the tree and when did their ancestors get to these places (in the Mexicans case, from where did they originate in Europe before colonizing Mexico? How old is the TMRCA of the largely Ashkenazi BY2807 and where did he appear to have lived? How old is the TMRCA of exclusively S/SE European subclades? How old are the TMRCAs of exclusively Georgian subclades? None of the few Georgian samples I have placed in subclades have any close matches. There are also at least four other Georgians who are so distant from other samples that I have left them off the tree. This includes two men from Khevsureti who share very rare STR markers (YCAII=19-20 and DYS464d=17) but have GD 27/111. This may indicate that many Georgians in Y16419 are survivors of old bottlenecks, some perhaps dating back to the original Y16419 man who entered the Caucasus. Most I-Y16419 lineages are found today in eastern Anatolia and the Caucasus, from Turkey to Armenia, Iran, Azerbaijan, Georgia, North Ossetia, Kabardino-Balkaria, Karachay. There are two reasonable theories regarding the origin of the Y16419 man who lived in 1300 BC. If he was born in the Balkans, then most of his surviving sons migrated to eastern Anatolia, Armenia, Georgia and Ossetia in the years after 1300 BC. Given that there are no surviving western Anatolian lineages it appears that all the migrants went to eastern Anatolia together. If he was born in eastern Anatolia or Armenia, then his descendants living in Europe today may be more recent immigrants from the Greek or Armenian diaspora. SNP testing has not conclusively established the ages of the exclusively ethnic Georgian lineages (as it has for the Armenian ones before 1000 BC), because there is only one sample in BY2818. However, based on wide STR divergence among Georgian samples in the project, their ancestors may have entered Georgia prior to the recorded history of both the Georgian and Armenian peoples and possibly before their ethnogenesis. If this is correct, then the first I-Y16419 men in the Caucasus were some of the common ancestors of both the Georgian and Armenian peoples. I-Y16419 ამ მოდგმის უამრავი ადამიანი ამჟამად ცხოვრობს აღმოსავლეთ ანატოლიაში და კავკასიაში, თურქეთში, სომხეთში, ირანში, აზერბაიჯანში, საქართველოში, ჩრდილოეთ ოსეთში, ყაბარდო-ბალყარეთში, ყარაჩაიში. საქართველოშიც: იმერეთში, სამეგრელოში, სვანეთში, ტაოში, ქვემო ქართლში, კახეთში, ხევსურეთში. ორი გონივრული თეორია არსებობს დაბადების ადგილთან დაკავშირებით I-Y16419 ძვ.წ. 1300.
თუ დაიბადა ბალკანეთში, მისი შვილების ნაწილი წავიდა აღმოსავლეთ ანატოლიაში, სომხეთში, საქართველოში ან ოსეთში ძვ.წ. 1300 წლის შემდეგ. ეს მოსაზრება ეფუძნება იმას, რომ ეს ხაზები არ არიან დასავლეთ ანატოლიაში, ყველა ემიგრანტი წავიდა ერთად აღმოსავლეთ ანატოლიაში. თუ დაიბადა აღმოსავლეთ ანატოლიაში ან სომხეთში, შთამომავალი, რომელიც ცხოვრობს ევროპაში, შესაძლოა ესენი არიან საბერძნეთის ან სომხეთის ემიგრანტები. SNP-ს არსებული მაგალითების ტესტირება ვერ ადგენს საკუთრივ ეთნიკური ქართული შტოების გენეტიკური წარმომავლობის ასაკებს (როგორც ეს დგინდება ეთნიკური სომხებისთვის — ანუ ჩ.წ.-მდე 1000 წ. ), რადგან BY2818-ში ქართველის მხოლოდ ერთი ნიმუშია. თუმცა, თუ გავითვალისწინებთ არსებით მრავალფეროვანებას ქართულ ნიმუშების STR-ებს შორის, შეიძლება ვივარაუდოთ რომ მათი წინაპრები საქართველოში უფრო ადრე დასახლდნენ, ვიდრე ამის თაობაზე რაიმე დოკუმენტური წყაროები გაჩნდებოდა (როგორც ქართული ასევე სომხური). და, თუ ეს მოსაზრება სწორია, მაშინ დასაშვებია, რომ როგორც ქართველებში ასევე სომხებში (ზოგადად კავკასიაში) I-Y16419 შტო ერთი კონკრეტული მამაკაცისგან მომდინარეობდეს და ეს მამაკაცი გახდა ქართველებსა და სომხებში ამ მოდგმის (დნმ შტოს) მამამთავარი. To advance our research into the Georgian I-Y16419 lineages, consider donating to the Georgian DNA project on FTDNA. Special thanks to Elene Tsutskiridze and Besarion Gugushvili for helping with the Georgian translation.